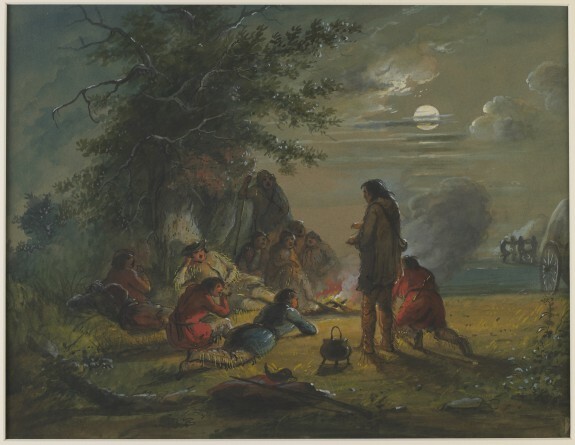 Description "An old trapper is up on his feet spinning a yarn wherein he is giving an account of an adventure of Markhead's with a grizzly bear. According to his account, Markhead was afraid of nothing on or under this earth, and 'was bound to shine in the biggest sort of a crowd.' The story, stripped of the trapper's ornamentation, was to this effect:- That Markhead for a wager determined to go into some wild cherry bushes where the bear was known to be, and dispatch him simply with a tomahawk. In this affair, the 'B'ar' was too much for him. In approaching him through the bushes, he was not aware that Bruin was so near, and in a moment the powerful brute had his paw on our hero's head, tearing away the entire scalp. Most wonderful of all in the course of time, the trapper entirely recovered, and when we reached the Rendezvous in Oregon, we saw him well and hearty; his head having little or no hair on it and presenting a very singular appearance." A.J. Miller, extracted from "The West of Alfred Jacob Miller" (1837). In July 1858 William T. Walters commissioned 200 watercolors at twelve dollars apiece from Baltimore born artist Alfred Jacob Miller. These paintings were each accompanied by a descriptive text, and were delivered in installments over the next twenty-one months and ultimately were bound in three albums. Transcriptions of field-sketches drawn during the 1837 expedition that Miller had undertaken to the annual fur-trader's rendezvous in the Green River Valley (in what is now western Wyoming), these watercolors are a unique record of the closing years of the western fur trade.